The Youth Action Board wants to hear from YOU! The Youth Action Board is working to identify barriers to empowerment in our community! Please take few minutes to answer this survey. 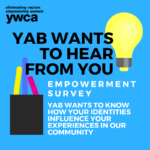 We want to hear from people of all genders and all ages!